The Z6Vet portable Color Doppler ultrasound system is a well-balanced choice for those who require both the value of features from traditional color Doppler ultrasound systems, and the accessibility of a lower price point. 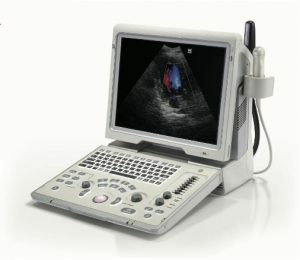 Inherited from our remarkable design and success in the field of developing ultrasound, the Z6Vet system will offer you amazing image quality and functionality with refreshing experience: we’ve done better to help you achieve more. Z6Vet will bring you more diagnostic confidence in improving patient care across a range of clinical applications. Comprehensive Clinical Applications To improve your flexibility in different clinical applications, Z6Vet provides new designed probes which is lightweight and durable, ready to perform in any clinical situation. Prominent Ergonomics To carry forward the classical ergonomic design of Mindray’s Ultrasound, Z6Vet features smart new shape, compact size and lightweight for enhanced mobility that allow Z6Vet to perform anywhere, any time. Multiple Beam Formation Maximum 4 times tasking for one transmitted beam, resulting in excellent time resolution and higher frame rate. Please download the Mindray Z6 Vet Brochure.